A new Hard Rock Hotel will soon begin rising in Atlanta’s historic downtown Castleberry Hill neighbourhood, part of a massive development project that includes construction of a US$1.6-billion sports stadium. Ground was broken this week on the 220-room Hard Rock Hotel Atlanta, scheduled to open in spring 2018 next to the new Mercedes-Benz Stadium. The retractable-roof stadium will be the home of the National Football League’s Atlanta Falcons and Major League Soccer’s Atlanta United FC, which will play the first game in the new facility on July 30, 2017. Castleberry Hill, a former industrial and warehouse district, has a growing arts and entertainment scene. 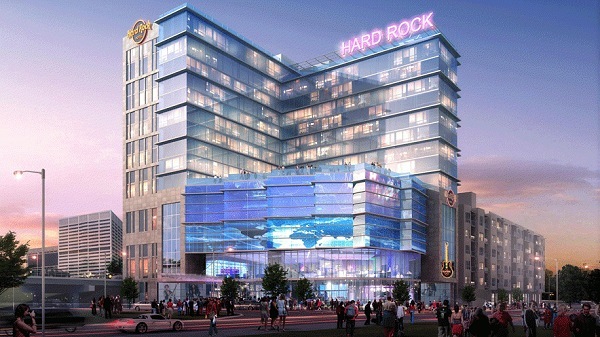 “The area’s energetic atmosphere and history of embracing artistic endeavors aligns well with the Hard Rock Hotel product and we’re sure the upcoming property will quickly become the go-to entertainment and leisure destination,” said Frank Chen, general manager of Bolton Atlanta, LP, the ownership group for the hotel.